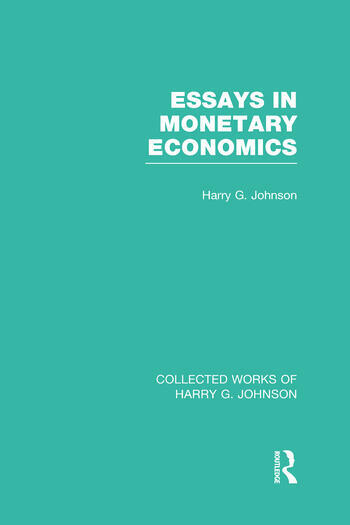 Reprinting the second edition (which included a new introduction explaining developments which had emerged since first publication) this book discusses explorations in the fundamental theory of a monetary economy, a theoretical critique of the ‘Phillips Curve’ approach to the theory of inflation and the theory of the term structure of interest rates in terms of the theory of forward markets pioneered by David Meiselman. Introduction to Second Edition. Preface. Part 1: Monetary Policy 1. Monetary Theory and Policy 2. Recent Developments in Monetary Theory 3. A Survey of Theories of Inflation 4. Money in a Neo-Classical One-Sector Growth Model 5. Notes on the Theory of Transactions Demand for Cash 5.1 Appendix: A Practical Application Part 2: Monetary and Fiscal Policy Issues in North America 6. Alternative Guiding Principles for Monetary Policy in Canada 7. Major Issues in Monetary and Fiscal policy in the United States Part 3: Monetary and Fiscal Problems of Developing Countries 8. Fiscal Policy and the Balance of Payments in a Growing Economy 9. Is Inflation the Inevitable Price of Rapid Development or a Retarding Factor in Economic Growth? 10. International Monetary Reform and the Less Developed Countries 10.1 Mathematical Appendix on Commodity Reserve Money. Index.